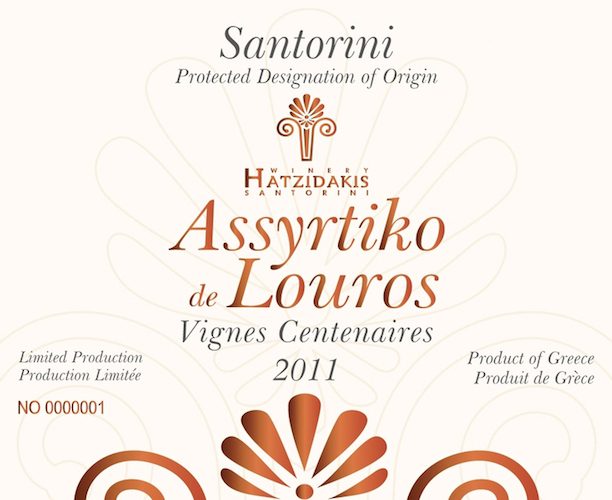 Assyrtiko de Louros, PDO Santorini, Assyrtiko 100%. Grapes from selected vineyards, at the wider area of Louros of the village of Pyrgos Kallistis and at an altitude from 180 up to 220 meters. Vinification: Skin contact for 12 hours, separation of must from grapes, clarification and fermentation with selected yeasts at 18 ˚C. Final fermentation and maturation on the Lees for 24 months in old barrels. Limited production. Characteristics: Yellow colour with intense golden hues, aromas of ripe stone fruits and oriental spices. Dense and mineral on the palate with typical acidity and a tannic long aftertaste. Served at 12-14 ˚C, with shellfish dishes, white and red meats, game, as well as mature full fat cheese. Potential aging in the bottle for more than 10 years.